Saw this article on a friends page and couldn’t resist sharing. Fantastic tips and tricks to upcycle items – I GUARANTEE you have in your house – and make your garden amazing! There are always tons of gardening tips and old wives tails that people are spreading all over the internet. We have highlighted 6 of our favorite, simple garden tips that you won’t want to miss! Placing Pennies in your garden can help to reduce the amount of Snails and Slugs that creep into your garden. You can also run copper wire or glue pennies on the top of your raised beds to create a barrier… Other’s have also used other tricks such as buried cups full of beer to “drown” the snails… we’ve tried it and it works beautifully! Use newspaper underneath mulch or raised beds to keep out pesky weeds and other undesireable plant life. The benefit in this particular tip is that it will eventually break down into the soil and create a good source of “feed” for worms, which are extremely beneficial to a healthy garden because they bring nutrients and air pockets into your root area’s. You can use old toilet paper rolls orpaper towel rolls to build nice cups for starting your seedlings indoors. It also helps reduce the amount of trash that we throw out the door every day! Re-using old household items is the next step in recycling. Using things such as oldbottles for irrigation is a great way to prevent more landfill waste and can actually SAVE YOU MONEY by not having to go buy something else for the garden! Things that you may never expect to be used in a garden can be re-purposed with great results. 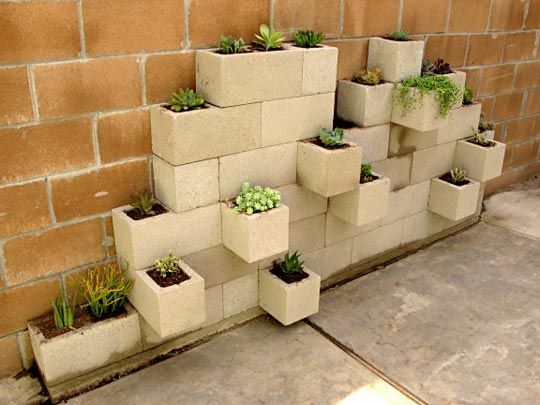 For example, this cinder block wall garden is a great way to create something unique and highly inexpensive. It also adds a nice design flair to an otherwise boring wall. Plus you get plants to spruce it up! We are surprised that so many people do not soak their seeds before they are planted. While it’s perfectly normal to just plant seeds directly into seed planting soil, you will be amazed at how quickly your seeds will sprout and grow. If you are having a hard time with seed germination, then the next time you try to plant, make sure you soak for 24 hours to get the best growth! For more junk tips, tricks and disposal, call Dump It! 365 – 250-807-7772. ← More than Just Junk Removal Kelowna! From homeless to homed, Thanks to YOU! !